RSVP This event will be held in the Chapel of St. Joseph at St. Joseph's University! NETWORK Lobby’s Nuns on the Bus is hitting the road -- for the first time in two years -- to hold elected officials accountable for their votes on the 2017 tax law and attempts to repeal the Affordable Care Act. The Nuns on the Bus “Tax Justice Truth Tour” starts in Los Angeles and ends with a Fiesta for the Common Good at Mar-a-Lago. Bring your friends and neighbors to a Town Hall for Justice in Philadelphia, PA! Join the Nuns on the Bus to learn about the new tax law’s negative effects on our country, share stories from your community, and hear how you can take action ahead of the midterm elections. This time last year, Republicans in Congress were hard at work enacting a tax law that overwhelmingly benefits the wealthy over working people. This new law gives 83 percent of the benefits to the wealthiest 1 percent and threatens funding for Medicare, Medicaid, and Social Security. Now, NETWORK Lobby’s Nuns on the Bus is hitting the road to demand accountability from our elected officials. 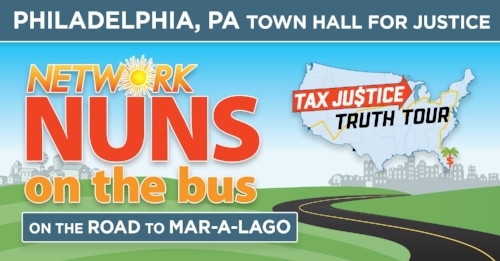 When you join the Nuns on the Bus in Philadelphia, you’ll get to add your name to thousands of others on the bus, so the Sisters can bring you with them all the way to Mar-a-Lago on their Tax Justice Truth Tour!